Apartment in Playa Flamenca, Nr. 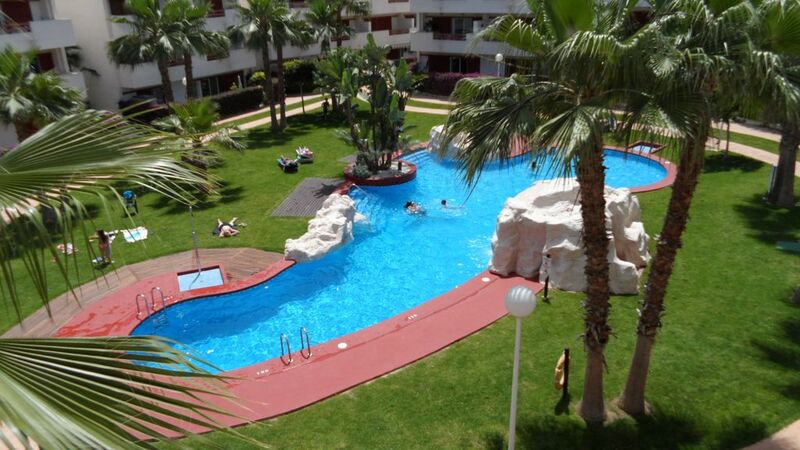 Torrevieja, Costa Blanca - Smart Location for Beach, Shops, Bars and 3 Golf Courses, Free Wi-Fi. Please note: Online payments are accepted through Owners Direct site if you wish to pay by debit/credit card. The booking service fee is charged by Owners Direct who offer this service with online payments. This is NOT charged by us. Welcome to our very popular well appointed apartment. Guests will not be disappointed with the accommodation. The 2 bedroom apartment suitable for 4 guests has adjoining en-suite bathrooms and air-con. It is located in a popular friendly secure development at El Rincon, Alameda del Mar, by Playa Flamenca on the Orihuela Costa, Southern Costa Blanca, Spain, ideal for Murcia and Alicante airports. The apartment comprises a comfortable lounge/dining area with sofa, dining table and chairs, English & international TV, (BBC / ITV etc), free cable Wi-Fi. Patio doors lead to a generous sunny balcony overlooking the communal swimming pool and landscaped gardens. Ideal for your relaxation and dining. You can sit on the sunny balcony and watch your children in the pool. There is a kitchen area - well equipped for four guests and utility room ideal for cases/golf clubs. The property has it's own shaded parking bay. Close to shops, bars, beaches and of course several golf courses. The cosmopolitan town of Torrevieja is a short drive away. The property will be prepared by our local house keepers Helen and Chris who provide a meet and great service at the property. There is a local fee payable for this of €70, payable on arrival please try and have the correct money. Spanish Tourism Licence VT-470867-A, so all legal. The property is owned by Lesley & Mark O'Dell, who reside in Warrington, Cheshire. We adore Spain hence the ownership of our apartment. Our friends also live near the property. We are married in our 60's and have three grown up children (2 sons, one based in Scotland one who works in car rental management for an international company, one who lives in Nashville, USA who works in vehicle management and our daughter who is a adminstrator in a car sales business locally. Lesley is retired. Mark has retired from his former Police career and now works as a freelance trainer assessor, delivering trainer / assessor course, first aid, lifeguard training and health and safety courses - We have both been actively involved in the Scout Association and Mark is a District Water Activity Adviser and a County Assessor for canoeing and rafting. El Rincon was purchased for it's location as a good holiday venue. The benefits being: gated secure community. Good standard of accommodation and sunny balcony overlooking community pool. Couple of supermarkets a short walk away. Playa Flamenca Commercial Centre containing plenty of restaurants only a short walk away. Blue flag beaches along the coast here. Cosmopolitan Torrevieja only a short drive away. Air-conditioned and heated property makes it ideal for winter lets. Covered car parking to keep your hire car cool. UK TV and other international channels. Free Wi-Fi bring your laptop/tablet/smart phone. We have holidayed in several countries, however El Rincon is well geared up for tourism and people keep coming back. Our properties are serviced by two local airports both within easy driving distance, namely Corvera (Murcia) and Alicante Airports. When we travel out and have a hire car we do travel out a bit further afield. The inland sea at La Manga is definitely worth a visit and shops in Torrevieja are good. You can even mud bathe by the salt pans at San Pedro, very popular with the locals. The master bedroom en-suite has a bath with shower over, basin, bidet and wc. Underfloor heating. The twin bedroom en-suite has a walk in cubicle shower, basin and wc. Underfloor heating. Hot air con. Oil filled radiator also supplied. Bathrooms under floor heating. Washing machine in kitchen, best used in morning to save on our electricity bills. Thanks. Bring your own beach towels. Apartment supplied towels are not to be used by pool or on beach. The lounge has a high quality chaise lounge sofa, a large sideboard, coffee table and is equipped with a 32" LCD TV with cable supplied which feature international TV channels including ITV and BBC. A DVD and Hi-Fi system is also provided. UK channels including ITV / BBC via Digi Box cable system. The LCD TV has UK channels including BBC1 and ITV. There are a few DVD's in property. Some CDs. Hi-Fi music centre. Balcony tends to get the sun, particulary in the afternoon. The property is great for golfers, three renowned golf courses are a very short drive away. Have a day out golfing return to the property for refreshment and rest and then walk out to the Playa Flamenca Commercial Centre for a pleasant evening meal and entertainment - perfect! The courses close by are: Villamartin, Campoamor, Las Ramblas. The La Manga (approx 30 mins by car) and other courses along the Spanish coast can be reached. See our personal website for details on golf courses. There is a lift to the apartment so wheelchair access is good, however using the wheelchair continually inside the apartment would be restrictive. Two pools in complex we overview the larger one. Notes on accommodation: The property has hot and cold air-conditioning. There is also a wheeled oil filled radiator should extra heat be needed in winter. Accommodation is suitable for children and you can contact a local company to supply any baby equipment you may need. Digital safe provided. Bring your laptop / mobile phone - free wi-fi connection. Outside: There is a choice of two community pools, our sunny balcony looks down on the larger one and landscaped gardens. The property has it's own covered and shaded parking space next to the lift to the property. The community is security gated and quite secure. The balcony has a table and 4 dining chairs. There are 4 folding beach chairs provided for your your convenience when you venture out. Utility Room: Ideal storage area for cases, golf clubs etc. this room also houses the ironing board, vacuum and hot water system. A wash basin is also fitted for cleaning buckets and spades etc. four beach chairs are also provided. Cleaning / Towels / Linen / Maid service: Guests are supplied with towels and linen. Guests must bring their own towels for beach and pool use. The property is fully cleaned before you arrive and on vacating the property. Glad you enjoyed your stay. Hope to hear from you again in the future. Staying for a few days break we were welcomed on arrival and shown around El Rincon, the apartment modern spacious very clean and well equipped, felt at home and relaxed straight away into our break. El Rincon is gated and secure so was very happy as we had a hire car. The apartment is close to shops restaurants and bars which is ideal, also close for travelling to see local towns and villages also beech 5 minutes drive to the nearest beach at Playa Flamenca. So pleased you felt relaxed and at home straight away. We aim to please. Your review sums it all up very well, although a car is nice if you want to explore further afield. Everything you need is practically on the doorstep. We were very impressed with the apartment, it was in pristine condition and had everything we needed. The pool area was superb and the children loved having it mostly to themselves. We could not have been placed in a better position as there were many bars and restaurants close by, also within a few minutes walk to large supermarkets. I would like to mention a big thank you to Helen and Chris who look after the property, they are a credit to the owners Lesley and Mark. Once again a big thank you and we will certainly be back again. We're from the Netherlands (so excuse my poor Englisch) and we've been at least 8 times in Orihuela. This is the second time in El Rincon. We had an extremely pleasant stay at this nice and clean apartment. We felt really save because of the security gate. Loved the wind from the sea. Great Wifi. Our children (8 & 12) loved it here. We've stayed in several other communities, and I think the regulations in El Rincon are quite soft compared to others. We really want to come back again to this apartment. After we left, we had an immediate call that my husband has left his wallet in one of the drawers. So thank you Lesley, Mark, Helen and Chris for your kindness and service. Lesley, thank you so much for your wonderful communication since this was our first time we booked at HomeAway. So glad you all had a good time; we will be pleased to have you here again in the future. Due to the building being built around the pool/gardens there is shelter from the sea breeze when you want to sunbathe but when it is very hot it is indeed a good idea to open the front door to get a little breeze from the sea. It was very fortunate that Helen and Chris went in to clean straight away and we were able to alert you that the wallet had been left........we worked as a team on that one. and hope to continue as a team. Thanks for your kind comments. Delighted you enjoyed your stay and look forward to hearing from you again. There are numerous blue flag beaches along this coast. These are life-guarded and have bars and toilets in the high season. For example Punta Prima, La Zenia, Torrevieja, Campoamor, Cala Capistan, Playa de Regia are a short drive away. The local beach at Playa Flamenca is very nice and can be reached in approx 15 mins on foot. Murcia (25 mins) and Alicante (45 mins) airports are ideal for the apartment and these airports are serviced by budget airlines. Car hire is not essential and airport pick ups can be arranged, but this will only be with a licensed service provider. A hire car does open up the coast line and inland towns. The apartment is not difficult to find full directions are provided, you can consider offsetting car hire against taxis? The coast road does have a good bus service. The Playa Flamenca Commercial Centre with banks, shops, bars and restaurants of all types is a short walk away. Three supermarkets are also close by eg. Lidl, Supercor and Carrefour. Plus Mercadona is a little further on but easily walkable. The cosmopolitan town of Torrevieja with it's excellent promenade, market stalls and general shops is a short 10 minute drive away, parking is available by the harbour. Large inland towns such Elche, Murcia, Alicante and even Benidorm can be reached by car. Long term lets at a lower rate will be considered. More pictures on our personal website see link below. Booking Notes:PLEASE NOTE THAT ON BOOKINGS TAKEN THROUGH OWNERS DIRECT THERE WILL BE A SERVICE CHARGE:ADDED. IT WILL TYPICALLY BE 7.98% + VAT. A non refundable deposit of 25% + the new service fee is needed to secure the booking. The rental balance + refundable key/damage deposit of £100 must be paid 4 weeks before departure. A meet and greet is provided at the property when keys are handed over. There is a local charge payable for this of €70 which also includes the preparation and cleaning of the property before and after your stay. . Please try and have the right money ready. Changeover Day: Arrival / departure dates and times are flexible especially if the house is not occupied on your arrival day and/or it is not required on your departure day. The normal entry time would be 4pm and a departure time of 10am, particularly in peak periods.